Step into the limelight. This is the most illustrious tenor horn in the world. By redefining professional expectations, the Besson Prestige BE2050 tenor horn in silver plate is now found in the hands of almost every master horn player. And it's easy to see why. Hand-made by artisans in Germany, the Prestige tenor horn is guaranteed to impress. When you're playing the Prestige horn, you will instantly notice how precise and responsive the instrument is. And even though the intonation is excellent, the BE2050 features a unique main slide trigger to ensure your tuning is always impeccable. 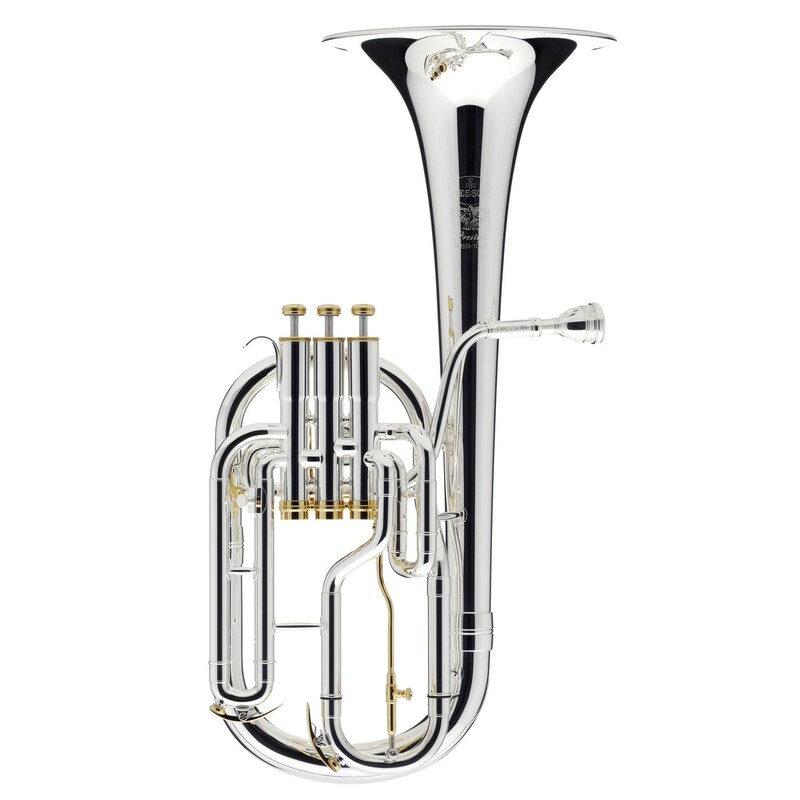 As per all Besson Prestige instruments, the BE2050 horn offers a tone that triumphs over rival instruments. This is why some of the world's leading soloists play on a BE2050 horn. And that is why the Prestige tenor horn is the instrument of champions. 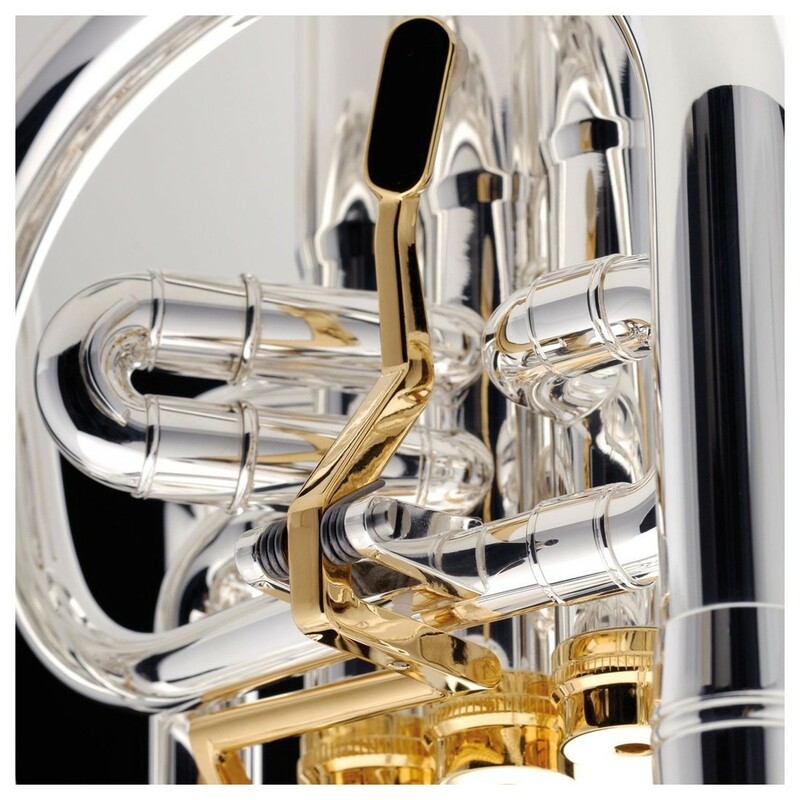 The Besson Prestige horn has been purposefully designed for the best of the best. Compared to a Sovereign horn, the Prestige offers a more focused and intense sound. The hand-hammered yellow brass bell is the key to producing an instrument with such a fine array of tonal colour. This material is perfect for musicians who need a versatile tone as it can comfortably play in any ensemble - no matter what the dynamic. To ensure you have a seamless experience, the valves in the BE2050 horn are crafted from monel. This nickel and copper alloy can be found in the majority of premium horns thanks to its resistant properties. Thanks to the dense characteristics of monel, it is more resistant to corrosion meaning they won't flake and are less likely to seize up. Although the tuning on the Prestige tenor horn is superb, Besson have included a trigger on the main slide. Not only does this unique trigger feel comfortable in your hands, but it also allows for correcting any intonation - even when playing open. When you hear a whole horn section play on Prestige horns, you hear something magical. This is why most of the world's leading brass bands choose Prestige instruments for their horn sections. A premium instrument deserves a premium case. This is why the BE2050 horn includes one of Besson's stitched black cases. The exterior of the case is made with robust hardwood and finished with a black material. For an extra touch of luxury, the case has the Besson logo in gold printed on the front. To ensure that you can store all of your music, the case includes a large pocket on the outside. The inside of the case is finished with a beautiful soft-touch burgundy material that will keep your instrument gleaming. To ensure that you can start playing straight away, the tenor horn includes an Alliance mouthpiece. Made in conjunction with Dr Roger Webster and Leslie Howie, this mouthpiece offers a great starting point for the horn. At the front of the case, you will find a large compartment which is ideal for storing all of your accessories. Also included is a lyre and a Besson branded micro-fibre cloth so you can keep your instrument looking its best.